strategy to complement hard copy editions of the content. The time readers spend reading your publication, the number of times your readers have zoomed in on each page or the average number of pages that your readers read per visit. The level of interactivity offered by a digital edition offers the potential to create a much more involving experience for the reader. Consider a video clip or YouTube video embedded into an article as opposed to only an image. Readers can listen to audio tracks which may be used for Interviews for example. Options which allow readers to send feedback and comments on the publication whilst also share with colleagues and friends. Advertising continues to move towards more spend on digital platforms all of which had the capability of creating real results which are easily measured. In 3D Issue Professional and Enterprise it is possible to create reports for advertisers based on clicks on banners or pages of the publication. These figures are good way to keep your advertisers coming back time and time again. 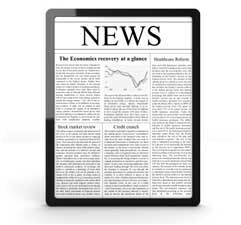 Digital Editions allow for the easy delivery of news immediately. This could represent a very large saving on the amounts spent on delivering hard copy publications. The use of Digital versions also opens up markets which would otherwise have been much more expensive for readers to access. The provision of a digital edition creates a feeling of satisfaction which we might say is derived from the association with a hard copy publication, as the digital edition offers more for the reader the level of satisfaction increases. So readers are happier and publishers can provide new and engaging content the capabilities offered by digital publishing is creating a completely new arena for the news.